Network Fun!!! 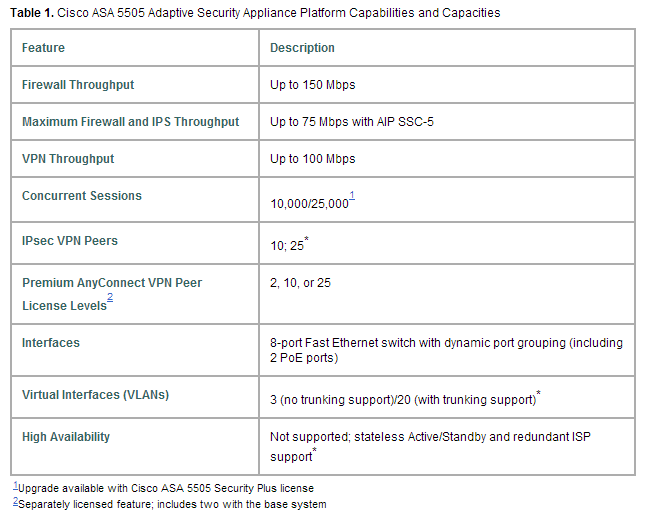 -- A Security/Network Engineer's Blog: Cisco ASA 5505: What Is The Difference Between A Base And Security Plus License? Cisco ASA 5505: What Is The Difference Between A Base And Security Plus License? I recently had to get an ASA 5505 ready for a remote site. One of the requirements was to implement vlans on the ASA. When I started the config, I noticed that the ASA had a Base license on it. You can do 3 VLANs with a Base license, but routing between the two internal (or DMZ) VLANs is not possible. Its going to take a Security Plus license for that, which the customer does not have. If you already have two VLAN interfaces configured with a nameif command, be sure to enter the no forward interface command before the nameif command on the third interface; the adaptive security appliance does not allow three fully functioning VLAN interfaces with the Base license on the ASA 5505 adaptive security appliance. For those of us new to the asa, would you recommend that we learn the command line or GUI? What are the limitations of strictly using the GUI? One more question, if your using an asa for a medium sized business 150-200 users, should you spend the money for smartnet? 1. When talking about the ASA, I always use CLI. If you learn the ASA in CLI, you will learn exactly WHAT you are doing and WHY you are doing it. When you do things in a GUI, it does the commands for you in the background, and you can learn HOW to do things without knowing WHY you did them. But, other people may be different than I am, that is just my thoughts on it. I do have a customer that prefers the GUI. He comes from strictly a Check Point background, so he is used to that. Nothing at all wrong with that. One size does not fit all. 2. The only limitations that I can think of is that I have been told in the past that the GUI is about 90% of the CLI. I don't personally know this and have not verified this. Again, I never use it (except for packet captures) so I don't really have a dog in that fight. 3. For smartnet, I personally think that the ASA is a device to have it on, but really only for the 5510 and above. Not the 5505. I don't feel this way about all products in the infrastructure, but the firewall I do. If it dies, then you get a replacement. Its just insurance, and I think that its worth it. Not only that, but you get access to Cisco TAC, which is second to none in tech support.